The diffusion of propaganda requires repetition. In the words of someone many leftists have secretly admired for long, repetition is what makes propaganda successful (the full quote is (bold-emphasis mine), "The most brilliant propagandist technique will yield no success unless one fundamental principle is borne in mind constantly and with unflagging attention. It must confine itself to a few points and repeat them over and over". This was a strategy used to brilliant success by militant Islamists, communist historians, and Indologists of dubious integrity in the west during the Ayodhya movement in the 1980s and 90s. The lie that was exposed by the Allahabad High Court was this - that there had been no structure beneath the Babri mosque, and certainly no temple, that the mosque had come up on barren land. Some of the other lies were even more imaginative - that Ayodhya itself was a mythical city and therefore the present day Ayodhya bore no connection with the Ayodhya of the Ramayana, and so on. The evidence presented to the contrary was impressive and immense. Archaeology spoke unambiguously. Yet the lie has persisted, amplified through incessant repetition in mainstream media and left-controlled academia. While the judgment of the Allahabad High Court, running into thousands of pages, is available on the net, it has been neatly summarized and made accessible to the lay reader by Meenakshi Jain, in her stunning book, "Rama and Ayodhya." 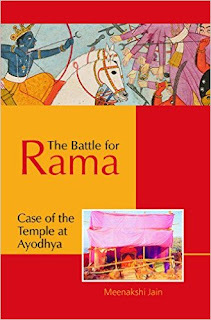 This book was published in 2013, and is an invaluable asset for anyone interested in a dispassionate history of the contentiousness surrounding the birthplace of Rama in Ayodhya. While the most entertaining parts of the book are where the author takes the reader on a journey through the surreal testimonies of the most eminent of historians to the Allahabad High Court, the book has immense academic heft when it covers literary, sculptural, epigraphic, and historical evidence to support the antiquity and ubiquity of Rama across India. On cue, almost immediately after the Allahabad High Court had delivered its verdict on 30th September 2010, "thirteen articles against the judgment published in various newspapers in the month of October 2010 alone were compiled by Sahmat and printed in a pamphlet..."
The 11th December 2010 issue of Economic and Political Weekly had as many as forty pages dedicated to the issue, in a section titled, "The Verdict on Ayodhya." High on rhetoric, low on facts and evidence, the articles stuck to the "propagandist technique" - constant repetition of a few points, "over and over." The Archaeological Survey of India was called "the statist asi [sic]", the judgment itself "hardly tenable", standing on "flimsy legal grounds", and much more. Leftist writings in general kept harping on a small set of points - that "Ayodhya was a mythical city", "Rama worship was an eighteenth-nineteenth century phenomena", and so on. The contention was that the belief in Ayodhya as Rama's birthplace was no more than a local legend, that the entire mythology of Rama and his veneration around the Indian sub-continent was no more than an 18th century phenomena, that the Babri mosque had been built on vacant land, and more. "Kautilya (fourth century BC) knew the central story of the Ramayana and Mahabharata. ... He said, 'Ravana perished because he was unwilling to restore a stranger's wife, and Duryodhana, because he was averse to part with a portion of his kingdom." The obvious takeaway is that the Ramayana - in its earlier forms at least - was known and its characters popular-enough for Kautilya to use as illustrative examples. Then you have Mahavibhasha, "a commentary on Katyayaniputra's Jnanaprasthana)", that states the Ramayana had 12,000 shlokas and that it "focused on two themes: Sita's abduction by Ravana and her rescue by Rama." This text, the Mahavibhasha, is estimated to have been composed during the rule of Kanishka, the Kushan ruler, around the 2nd Century CE. Again, the point is that a text won't find such mentions unless and until it was well-known and was considered important enough at the time. In the third century CE, "K'ang-seng-hui rendered the Jataka form of the Ramayana into Chinese." The Buddhist logician, Dinnaga, wrote the Kundamalla, an "interesting Sanskrit drama", based on the Ramayana. Dinnaga lived in the 5th century CE. Janakiharan, "the earliest Sanskrit work of Ceylon", was composed in the sixth century CE. Varahamihira, in the 6th century CE, "formulated rules for making images of Rama." By the seventh century the Ramayana was popular in Cambodia, as attested by Khmer citations; by the ninth century a version of the Ramayana had been written in Khotanese, an Iranian dialect. There are Tibetan versions of the Ramayana dating back to the seventh-ninth centuries. 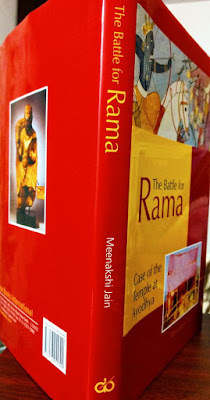 This is just the literary evidence, which provides copious evidence of the spread of the cult of Rama - across India and Southeast Asia - starting more than two-and-a-half thousand years ago. While Mughal king Babur's memoirs (Babur-nama) do not record what happened between April and September of 1528 - "during which period the Babri Masjid was apparently raised" - the "widely-held belief" is that the Janmabhumi temple was a source of envy of "local Muslims, especially the pir, Fazl Abbas Musa Ashikhan." [bold-emphasis mine] This factoid would count for nothing much but for the fact that "Ashikhan's grave at Ayodhya is marked by two pillars of a temple, which resembled the fourteen pillars inside the Babri Masjid." An argument made by leftist historians was that the pillars inside the Babri mosque were mere pillars and had nothing to do with a temple. We will see later what the evidence had to say about this matter. There are three mosques most associated with Babur that survived into the twentieth century. In 1526, Babur fought the first Battle of Panipat against Ibrahim Lodhi. This battle is seen as establishing the start of the Mughal rule in India. It would take more than a hundred and fifty years for Mughal rule to spread over most parts of India, and less than seventy-five years after that to be reduced to nothing more than titular rule in parts of Delhi. But back in the sixteenth century, Babur marked this victory with a mosque in Panipat (Kabuli Bagh mosque - named after one of Babur's wives). "According to Hindu tradition that was known to the Mughals, the last incarnation of Vishnu would appear in Sambhal at the end of the era." The use of temple material in the mosque at Sambhal "is evident in the internal architecture of the building." The place was said to be known as Hari Mandir before the Jami mosque was built in its place. The third prominent mosque was the Babri mosque, in Ayodhya. Again, the choice of Ram Janambhoomi at Ayodhya for the construction of this mosque was not accidental, but deliberate. Meenakshi Jain notes that while Babur had initially based his claims to sovereignty on "grounds of his Timurid heritage and Turkishness," this changed after his conquest of India - he would refer to Hindus as "kafirs," and "termed the war against Rana Sangha as "jihad." "Soon after defeating Rana Sangha, he assumed the title of Ghazi, a soldier committed to the cause of Islam." This suggests that the choice of mosques Babur got built had substantial military or religious significance. Panipat, Sambhal, and Ayodhya as mosques were therefore not accidental, but deliberate. Then there is the record of Aurangzeb, a descendant of Babar, who "constructed two mosques in the Svargadvara area, where had stood two Vishnu shrines." If it is to be argued that the Ram Janambhoomi temple at Ayodhya was destroyed by Babur and a mosque constructed atop its ruins, it is important to know whether such temple destruction was consistent with the acts of Turkic, Islamic and other Arab invaders in medieval India. If it turns out that there is little historical evidence to support the assertion that these invaders had destroyed temples and built mosques in their places, then the case for a temple at the site of the Babri mosque becomes that much weakened. To that end, the historical record argues leaves little room for ambiguity. Banaras was "totally devastated in 1194 CE by a Ghurid force led by Qutubuddin Aibak." The Omkara Temple in Kashi, atop a hilltop, was the site of the most important Shiva linga in Kashi. The complete area of the Omkara Temple was taken over, and remains strewn with graves and the shrine of a Muslim Saint. Aurangzeb had a huge mosque constructed at the site of the Bindu Madhava ghat atop the Panchaganga Ghat. Raziya Sultana appropriated the site of the Vishwanath Temple and had a mosque constructed there. The Vishwanath Temple was then rebuilt at another location, where too it was ravaged. When the Vishwanath Temple was first attacked by Aibak in CE1194, Brahmins hid the jyotirlinga in the jnanavyapi, the well of knowledge. Aurangzeb's troops had to fight a pitched battle with the ascetics of the Dashanami order at the jnanavyapi. If it was an undeniable fact that temple destruction was part and parcel of the Islamic invaders, equally undeniable were the never-ending attempts by Hindus to reclaim and reconstruct their temples. As the Mughal empire declined in the eighteenth century, shortly after the death of Aurangzeb, Hindus started to rebuild many of their destroyed temples. In this they were aided by Marathas as well as Rajputs. Banaras, which had been "devastated" in the twelfth century and again over the centuries, "was substantially rebuilt with generous Maratha contributions." Peshwa Balaji Baji Rao spent a considerable amount of time in getting Benares (Kashi), Allahabad, and Ayodhya from the Nawab of Awadh. The Ajmer ruler, Sawai Jai Singh, emerged as another such protector of Hindu rights in the eighteenth century. "Malharrao Holkar, in CE 1751, had pitched his monsoon camp at the Doab, and intended to pull down the grand Masjid built by Aurangzeb..."
While the decline of the Mughal empire in northern India made it possible for Hindu kings at the court of the Mughal king and elsewhere to extract small favors like the discontinuance of jaziya, this repossession of sacred Hindu sites was also aided in no small part by the "militarization" of several ascetic sects who "organized into akharas to protect Hinduism from iconoclastic fervor." One such sect was the Dashanami order that fought "pitched battles" against Aurangzeb's troops who finally succeeded in destroying the Vishwanath temple at Kashi. This was the third time the temple had been destroyed by Islamic invaders. Clearly, regaining, protecting, and reconstructing their sacred sites was an ongoing battle for Hindus for several centuries. The Ajmer ruler Jai Singh also purchased land and established Jaisinghpurias at almost all important religious centres in North India. Ayodhya was one such place considered important enough. Academics who studied surviving documents were able to show that Rama Janmasthana in Ayodhya was situated in Jaisinghpuria. This was important because the documents showed that this land was acquired by Sawai Jai Singh in CE 1717, and the ownership of the Rama Janmasthana land was vested in the deity. Furthermore, the "Janmasthan at Ayodhya was owned by the Kachhwahas of Amer-Jaipur in perpetuity, and their hereditary title of ownership was recognised...... and enforced by the Mughal State from CE 1717, when the grant was originally made." During the course of the entire duration of the controversy in the late 1980s and the 1990s, no single group did more harm to the cause of an amicable resolution than the cabal of leftist historians from JNU. JNU, as Jawaharlal Nehru University is referred to, is so-named after India's first Prime Minister and was founded by his daughter in 1969 as a place to breed leftist historians who would be loyal to the Congress Party. Mrs. Gandhi's hope was that by feeding and nurturing a gang of otherwise unemployable leftist historians, she would breed a generation of historians who would be less virulent than the communist historians outside her direct control and who would be sympathetic to her and the Congress(I) Party. In less than two decades, JNU grew to be an unaccountable monster that feeds on hundreds of crores of rupees in taxpayer subsidies every year, and is infested with historians whose Hinduphobic bile has steadily eroded the very roots of the nation that feeds them. The situation continues unchanged to date. At the forefront of this hideous group of historians was Irfan Habib, son of historian Mohammad Habib. Mohammad Habib was a professor at the Aligarh Muslim University and who had once boasted that he had taught Pandit Nehru history at "his feet". It was little wonder then that his son Irfan Habib enjoyed considerable government patronage and an almost unbridled control over bodies that funded historical research from taxpayer money. Irfan Habib was the leader of the gang of leftist historians which consisted, among others, of Professors R.S Sharma, M. Athar Ali, D.N. Jha, Suraj Bhan, Romila Thapar, Bipin Chandra, S. Gopal, D Mandal. This clique had taken it upon themselves to not only scuttle any and all attempts at a compromise between the Babri Mosque supporters and the Ram Janambhoomi advocates but also falsify history with a brazenness that would have shocked even inured workers of the world's oldest profession. "This resulted in a reversal of the thought process amongst Muslims who had till then, been pondering wholeheartedly about giving back the mosque and settling the matter amicably. They came to a renewed conclusion that the mosque will not be given..."
"Though we do not deny the possibility of the presence of temples in an ancient city like Ayodhya, despite our frantic and continuous search for the presence of a temple at the Babri site for the last twenty-two months, so far we have not been favoured with any luck." During the demolition of the mosque on 6th December 1992, a stone slab measuring approximately 5 feet by 2.25 feet was discovered. The Allahabad High Court directed Dr. K.V. 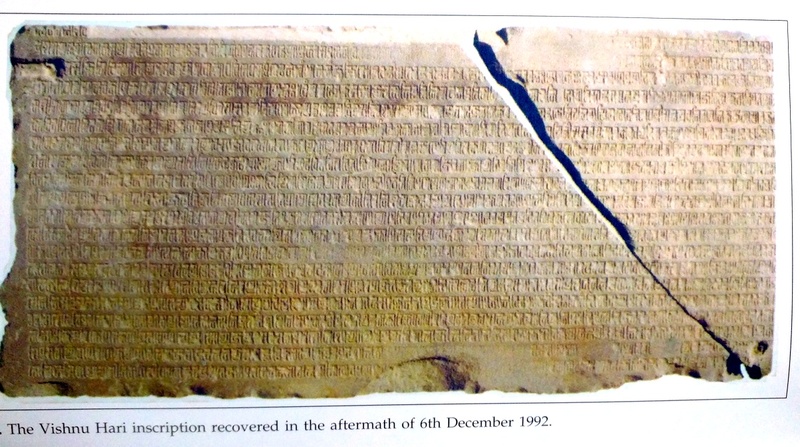 Ramesh, "renowned epigraphist and former Director of Epigraphy, ASI" to decipher the inscription and provide a translation. Dr Ramesh dated the slab, based on paleographical evidence and from the evidence provided by the historical evidence provided by the inscription itself, to the mid-twelfth century. The leftist historians claimed that the slab may or may not have been genuine. Their second attack was to claim that the slab could not have come from the mosque since "there was no temple at the site of the Babri Masjid in Ayodhya." This scholarly analysis was presented in a paper by D. Mandal in February 1999. So scholarly was the paper that D. Mandal chose to present "absolutely no explanation for this analysis." Remember this name - D. Mandal, since this gentleman would provide no small amount of comic relief later on and also help, inadvertently, to destroy the academic reputation of Diana Eck, a Harvard professor and Indologist. No less entertaining was a gentleman named Sita Ram Roy, who claimed the inscription was no earlier than the eighteenth century. Why should this claim be "entertaining"? Because Sita Ram Roy had not seen the "full photograph, estampage of the inscription or its decipherment" of the slab. He admitted as much under oath to the Allahabad High Court. Yet he found nothing anomalous on passing judgment on the antiquity of the slab found at the Babri mosque. Irfan Habib's was the most vitriolic, most sustained, and most calumnious of the campaigns mounted against this inscription. He wrote in 2002 that the inscription had been "brought from somewhere else." The "somewhere else" itself kept changing. In 2002 Irfan Habib had pontificated that it 'must have come "from some private collection."' Four years later he knew better. He stated with authority that the slab had been "surreptitiously removed from the Lucknow Museum and paraded off as a find from the Babri Masjid." Genius comes in threes. Not entirely satisfied with his modified explanation, Irfan Habib yet again modified his grand unified theory of conspiracy by claiming that the said slab had actually come from the Treta Ka Thakur temple in Ayodhya, from where it had come to the Faizabad Museum, and then to the Lucknow Museum, and from where the said slab had been "mysteriously disappeared." This slab from the Treta Ka Thakur temple matched the "one planted at Ayodhya." QED. Case closed, it would seem. Irfan Habib had proven this subterfuge, it would appear. Refutations can be tragic. They can be comic. In the case of Irfan Habib's assertions, the refutation was not only devastating, but ironic, coming as it did from a student of such eminent leftist historians as R.S. Sharma and D.N.Jha. This former student was Kishore Kunal, who had been Officer on Special Duty (Ayodhya) under Prime Ministers V.P. Singh and Chandra Shekhar. 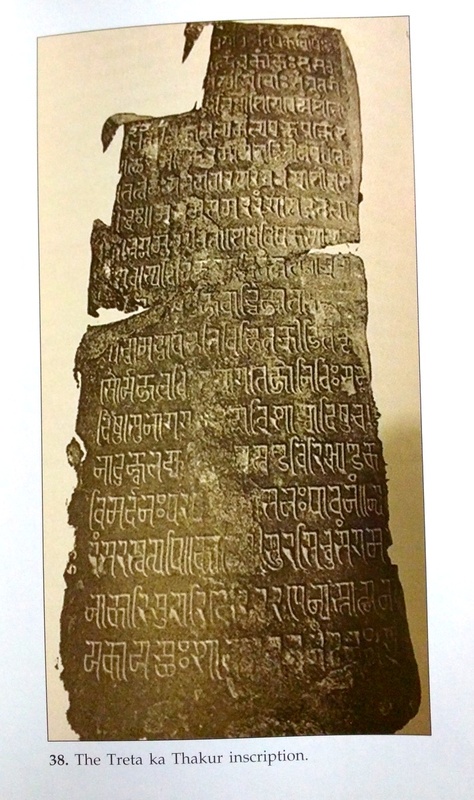 Kunal published, "perhaps for the first time, a photograph of the Treta Ka Thakur inscription" at the Lucknow Museum. The inscription matched exactly the description as recorded in the Annual Report of Lucknow Museum from 1950-54. Sita Ram Roy's assertion were provably wrong, and to put it politely, rubbish. To date, none of these eminent historians have responded to the publication of the photograph of the Treta Ka Thakur inscription. Whether they have been finally discovered a sense of shame is not clear, but their silence has spoken volumes. Why I have referred to this ragtag collection of leftist historians from JNU in a somewhat derogatory manner may become clear when you read their sworn testimonies to the Allahabad High Court. These coterie appeared on behalf of the Sunni Central Wakf Board. "It is correct that I am expert in Ancient History. I have not read Baburnama. I am giving statement on oath regarding Babri mosque without any probe and not on the basis of my knowledge, rather I am giving the statement on the basis of my opinion. Whatever knowledge I gained with respect to disputed site, was on the basis of newspaper or what what the others told. I have read nothing about Babri mosque. I did not study thoroughly, therefore, I cannot say as to when Babri mosque came into existence." "I have done deep study about Babri mosque. At present I fail to recollect when and for what purpose it [Jaziya tax] was levied. I do not remember that the Jaziya was levied only on Hindus. I have read many books written from the time of Baburnama to 1989, regarding construction of Babri mosque. I do not remember the name of any book right now." "Neither I can read nor write Persian. I can also not read Arabic Language nor can write it. I have no sound knowledge of Sanskrit also. I have not studied the Science of Calligraphy. I have also not studied the subject of Epigraphy. It is true that, in my foot note of my book, I have mentioned those books too which I have not read. I have no knowledge of Numismatic. I did not acquire any knowledge of archaeology. I did not acquire any knowledge about survey of land. I did not acquire any specialized knowledge in Science of Architecture. I have adopted Islam religion at the time of my Nikah." "I have no knowledge of this fact whether the Commission found me guilty of indulging in scrofulous conduct or using salacious language with lady teacher and students of said University (Allahabad University)." "I am an M.A. in Sanskrit language. I cannot tell when Indus Valley (civilization) was discovered. I did not read what features a mosque may not have. I am not a specialist in epigraphy and numismatics. I am not a student of History. I am not a specialist in architecture. I am not a specialist in sculpture. Epigraphy too, is not my field. It is true that I had formed my opinion prior to submission of ASI's report." Remember D. Mandal? He never obtained a Ph.D. but nonetheless several students were awarded Ph.Ds under his guidance. He retired from the Department of Ancient History and Archaeology at the Allahabad University. Diana Eck is a faculty member of The Prince Alwaleed Bin Talal Islamic Studies Program at Harvard University (the Program was established as a result of a $20 million grant by the Saudi prince, Alwaleed Bin Talal). In her 2012 book, "India: A Sacred Geography" (my review), she had very bluntly and pointedly argued against the evidence of a temple at the disputed site, citing "Indian historians and archaeologists, both Hindu and Muslim." Diana Eck wrote in her book that "archaeologist from the University of Allahabad wrote frankly in summarizing his findings, "There is not a single piece of evidence for the existence of a temple of brick, stone, or both." For reasons that should become clear very soon, Diana Eck chose to bury the archaeologist's name in the references section of her book. That archaeologist's name is D. Mandal, from the University of Allahabad. I do not have any specific knowledge of history of Babur's reign. Whatsoever little knowledge I have about Babur is only that Babur was the ruler of the 16th century. I never acquired knowledge in archaeology. I did not get any degree of diploma in archaeology. After hearing D. Mandal's testomony, the High Court had this to say - "the statements made by him in cross examination show the shallowness of his knowledge in the subject" and "we find that the entire opinion of this witness is short of the requirement under Section 45 of the Evidence Act 1872 to qualify as an expert." D. Mandal was the sole archaeologist that Diana Eck, Harvard professor and towering colossus of Indology in the west, rested her academic reputation on. D. Mandal was the iceberg that Diana Eck willingly steered the Titanic of her academic reputation into. The "archaeologist" that Diana Eck relied upon to assert confidently that there had never been any temple beneath the Babri mosque had no "knowledge in archaeology", had no "degree or diploma in archaeology", had "never visited Ayodhya", had no "specific knowledge of history of Babur's reign." In many ways however, the biggest tragedy lies in the turn that the leftist historians forced upon the country. It is reasonable to believe that Muslims and Hindus, if left alone, would have arrived at a consensus that would have seen the orderly and peaceful relocation of the Babri mosque, the construction of a temple befitting a place revered as the birthplace of Lord Rama, and become the twenty-first century template for peaceful co-existence between the two religions. But that was not to be. The venomous designs of the leftist historians combined with the intolerant fringe and went about brewing a toxic potion of communal tensions that have brought nothing but social unrest and poisonous political machinations of religious appeasement. © 2017, Abhinav Agarwal (अभिनव अग्रवाल). All rights reserved.